Take Current Affairs quiz March 9, 2019 to enhance your General Awareness. Practice with our esteemed Current Affairs quiz March 9, 2019 questions which covers all important events across India as well as World. Make use of all important Current Affairs quiz March 9, 2019 questions with answers updated here, at free of cost to succeed in all competitive Exams and Interviews. The Centre has planned to set up the Centre for Disability Sports at __________. The Union Cabinet has approved the proposal for setting up of a Centre for Disability Sports at Gwalior in Madhya Pradesh. The Independent Verification and Validation (IV&V) facility of NASA in West Virginia is named after __________. NASA has honoured Katherine Johnson,by renaming its Independent Verification and Validation (IV&V) facility in West Virginia in her name. How much did the NGT lay penalty on Volkswagen for using cheating device in testing? The National Green Tribunal (NGT) ordered Volkswagen India to deposit a sum of Rs.500 crore with the Central Pollution Control Board (CPCB) within two months for using cheat devices in its diesel vehicles. Who is the Chairman of the Cabinet Committee on Economic Affairs? Prime Minister Narendra Modi is the Chairman of the Cabinet Committee on Economic Affairs. Which Committee approved new rules to provide greater coal availability? The Cabinet Committee on Economic Affairs on Thursday approved new rules that will provide greater coal availability to stressed thermal power projects, based on the recommendations of the Group of Ministers constituted to look into the issue. Who has been named as youngest self made billionaire of all time by Forbes magazine? Jenner, 21, made it onto the annual Forbes list of billionaires after debuting her Kylie Cosmetics online in 2015 with $29 lip kits containing matching lipstick and lip liner. Tamil Nadu's 16-year-old, Iniyan Panneerselvam, became India's _______ chess Grandmaster. Iniyan Panneerselvam defeated Ukraine's 37-year-old Grandmaster Sergey Fedorchuk in Noisiel Open chess tournament in France to become India's 61st Grandmaster. Which state recently launched Jal Amrutha scheme to conserve water? Karnataka Government has launched Jala Amrutha, a community-driven movement (scheme) for water conservation in the state. It will be major water conservation scheme that will focus on drought-proofing measures, including protection and rejuvenation of water bodies. Government doubled income tax exemption limit for gratuity from Rs 10 Lakh to Rs ________. The government has doubled the income tax exemption limit for gratuity to Rs 20 lakh from the existing Rs 10 lakh. It will be implemented from March 29, 2018. Which state government recently unveiled Yuvashree Arpan Scheme? West Bengal Chief minister unveiled Yuvashree Arpan Scheme. Under Yuvashree Arpan, 50,000 youths will receive financial assistance of Rs 1 lakh each for setting up an enterprise. IRDAI and NHA form working group to curb fraud in Ayushman Bharat scheme. United Bank of India won HDFC Life sign bancassurance deal. Are you looking for right place to enhance your Knowledge on Current Affairs of 9th March 2019 through effective Quiz section? 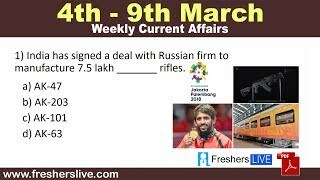 FreshersLive grants you the advantageous Current Affairs Quiz questions with accurate answers for 9th March 2019 which covers all the important events, supreme Awards, major occurrences in the National as well as World level. All important Current Affairs Quiz questions of 9th March 2019 are updated instantly in this page. Everyday at least 25+ Current Affairs Quiz Questions are displayed in this FreshersLive page. Correct Answer for each quiz question is given at the end of the entire 9th March 2019 Current Affairs Quiz questions section. You can estimate and upgrade your GK by attending these useful quiz questions. Entire quiz questions of 9th March 2019 Current Affairs covers Competitive Exam as well as Interview point of essentially important topics like International News, National News (ie. Indian Affairs), Science & Technology News, Environmental News, Bills & Acts Passed by Government, Defence News, About important Persons, Places, Banking & Economical News, Awards & Honours, Sports News, Revolutionary Updates on Arts & Culture, Obituary, Summits & Conference, Important Committee, Schemes, Appointments, Important Days & its Theme for Current as well as upcoming Year, Books & Its Authors, Agreements & MoUs, Budget, Taxes, Various Important Lists & Indexes, Visits by World Presidents, Prime Ministers, Political affairs and all Current Events. 9th March 2019 Current Affairs Quiz Questions updated in this page are prepared in the sense to help all aspirants to succeed in various Competitive Exams like UPSC IAS and other Civil Services Examination, Various Bank exams like IBPS PO, IBPS Clerk, SBI PO, SBI Clerk, RRB PO, RRB Assistant, Insurance exams like LIC AAO, UIIC Assistant, Railway Exams, Various Central Government Exams like SSC CGL, SSC CHSL, and more. Attempt all the Current Affairs Quiz Questions of 9th March 2019 and evaluate your score by matching your response with the correct answers mentioned at the end of this quiz questions section. By practising the FreshersLive Current Affairs Quiz Questions on a daily basis, you can surely succeed in the competitive exams as well as the interviews easily. Make use of this ultimate resource to the fullest and quickly achieve your goal!